The privacy-enhancing Tor network has seen its total number of users per day more than double in the last month, reaching the highest levels since the project first began compiling usage statistics. The network, which anonymizes internet traffic by routing it through a series of encrypted relays, had been humming along with an average base of around 500,000 directly connected users for most of the year. But that started to change around mid-August, and the results were both sudden and dramatic. As of Wednesday, the Tor network was seeing more than 1,200,000 users connecting daily, a figure that topped the previous record of around 950,000 global daily users in January 2012. The reasons for the usage spike are not clear, but you can pretty much take your pick. The figures come on the heels of a seemingly never-ending series of revelations about security agencies in the US and UK and their roles in spying on internet traffic, both at home and abroad. In early August, Lavabit and Silent Circle both shut down their secure email services, citing government pressure and the difficulty involved in plugging all the leaks inherent in the internet email protocols. Then, as the month rolled on, the US National Security Agency's surveillance activities were revealed to have far surpassed the agency's mandate to keep an eye on foreign agitators. We learned that NSA agents secretly yet routinely shared intelligence with the Drug Enforcement Administration, spied on thousands of US citizens who had no relationship to ongoing terror investigations, and even allegedly bugged the United Nations. Across the pond, Blighty's Government Communications Headquarters stormed the offices of The Guardian newspaper and smashed some of its computer equipment in an apparent attempt to intimidate it into not reporting on the GCHQ's surveillance activities at home. 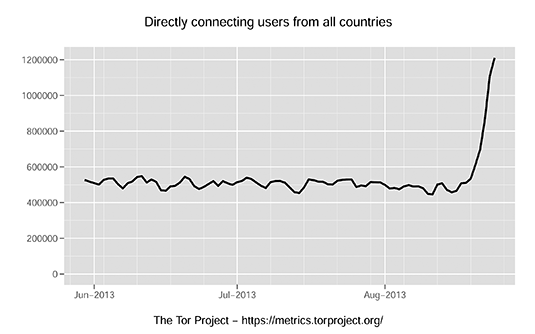 Sure enough, Tor users in the US and the UK made up a large portion of the total in August. Around 90,000 Americans were connecting to Tor daily at the start of the month, but that figure grew to around 150,000 daily users by the end. UK daily users grew from around 16,000 to more than 35,000. But other countries saw similar increases, too. India's Tor usage skyrocketed from just 7,500 daily users to over 32,000. In Brazil, usage climbed from around 15,000 to more than 85,000 users. Even China's Tor usage was on the rise – though, given the PRC government's tight control over internet access, there remain fewer than 400 confirmed Chinese Tor users per day, on average. Mind you, there have been similar spikes in Tor usage before, and they have generally been short lived. It's entirely possible that this latest increase may have nothing to do with public concern over domestic spying, but stems from some other cause. For example, in early August the Tor Project admitted that the network had come under attack by a previously unknown malware exploit. A similar assault could potentially be possible for late August's sudden surge in Tor usage. The Reg will keep you posted if we learn anything new. But whatever the cause, as the Tor Project's Roger Dingledine observed on Tuesday, "It's not just a fluke in the metrics data – it appears that there really are twice as many Tor clients running as before."